Six Mobile Threats for 2019 | HOBI International, Inc. Mobile security is at the top of every company’s worry list these days and for good reason. Nearly all workers now routinely access corporate data from smartphones, and that means keeping sensitive info out of the wrong hands can be an increasingly difficult task. That said, when the average cost of a corporate data breach is a whopping $3.68 million, which according to a 2018 report by the Ponemon Institute is 6.4 percent more than the estimated cost from last year, the stakes are seemingly higher than ever. This is seen as being one of the most worrisome threats to enterprises security as we head into the new year. The worst part about data leakage is that is isn’t nefarious by nature. Instead, it is based on wether users make ill-advised decisions about which apps are able to see and transfer their information. Other issues beyond accidental leakage involve transferring company files onto a public cloud storage service, pasting confidential info in the wrong place, or forwarding an email to an intended recipient. For this type of leakage, data loss prevention (DLP) tools may be the most effective form of protection. This type of software is designed explicitly to prevent the exposure of sensitive information. A mobile device is only as secure as the network through which it transmits data. In an era where we’re all constantly connecting to public Wi-Fi networks, that means our info often isn’t as secure as we might assume. According to research by enterprise security firm Wandera, corporate mobile devices use Wi-Fi almost three times as much as they use cellular data. Nearly a quarter of devices have connected to open and potentially insecure Wi-Fi networks, and 4 percent of devices have encountered a man-in-the-middle attack — in which someone maliciously intercepts communication between two parties — within the most recent month. McAfee, meanwhile, says network spoofing has increased “dramatically” as of late, and yet less than half of people bother to secure their connection while traveling and relying on public networks. 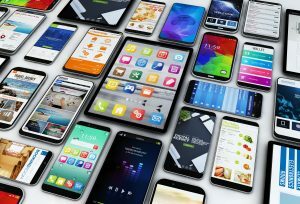 A relatively new addition to the list of relevant mobile threats, cryptojacking is a type of attack where someone uses a device to mine for cryptocurrency without the owner’s knowledge. Essentially, it is a process that uses your company’s devices for someone else’s gain. It leans heavily on your technology to do it, which means affected phones will probably experience poor battery life and could even suffer from damage due to overheating components. And of course, a lost or stolen device can be a major security risk, especially if it doesn’t have a strong PIN or password and full data encryption. Consider the following: In a 2016 Ponemon study, 35 percent of professionals indicated their work devices had no mandated measures in place to secure accessible corporate data. Worse yet, nearly half of those surveyed said they had no password, PIN, or biometric security guarding their devices — and about two-thirds said they didn’t use encryption. Sixty-eight percent of respondents indicated they sometimes shared passwords across personal and work accounts accessed via their mobile devices.